If you’d like further information or would like to apply for Pupil Premium, Sarah in the office will be only too happy to talk to you or help you fill out the form. 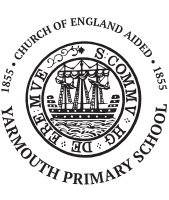 At Yarmouth School we have 78% (11 out of the cohort of 14) can swim confidently and proficiently of a distance of at least 25 metres in a range of strokes. 78% (11 out of 14) of the group can perform safe-rescue in different water-based situations. They are all looking forward to learning more about water safety during our ‘Beach Day’ at Sandown on July 10th.